Store shelves may be sparkling with snowflakes and Christmas ornaments, but autumn's not officially over yet! 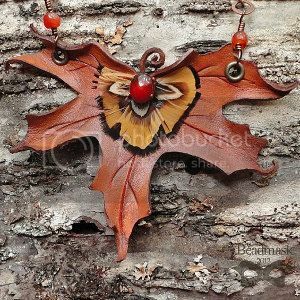 Branch out to My Sweet November, Beadmask, WireQueen Jewelry and Life is the Bubbles for fantastic jewelry in late fall colors of copper and orange. 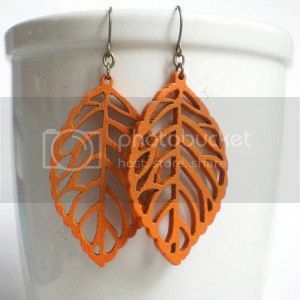 My Sweet November's orange leaf earrings are created with laser cut wood shapes that have been painted a lovely deep orange. The fall leaves hang from antique brass ear wires. Total length from the curve of ear wire to bottom of leaf is 2 3/8". The earrings are lightweight and perfect for everyday wear. Rubber stoppers are supplied for those graceful girls like me that somehow get earrings without backs tangled in hair and then dropped onto a bathroom floor. is an amazing autumn accessory! The leaf was hand cut, carved and sculpted from premium tooling leather. The shape was then hand painted in rich earth tones of cocoa, cinnamon and goldenrod. A medallion of pheasant feathers and a carnelian agate set in aged brass accents the center. The neckline features ancient carnelian agates from Tibet that connect to an antique copper tone chain and closes with a lobster claw clasp. 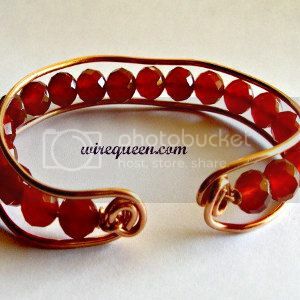 WireQueen Jewelry's carnelian copper Bohemian bangle is a powerful bracelet that could enhance your ambitious drive. Carnelian is known as an excellent career stone, helpful in making choices and decisions. The reddish orange carnelian beads are faceted and wrapped into a thick copper round wire (18 gauge). The wire wrapped bangle is adjustable so it will fit most wrists. The bracelet would work wondrously to accessorize a club or resort outfit. Life is the Bubbles' Lion King necklace is a toe-tapping reminder to have No Worries! I agree with the mother-daughter design team - I can’t see the words "Hakuna Matata" without singing them! 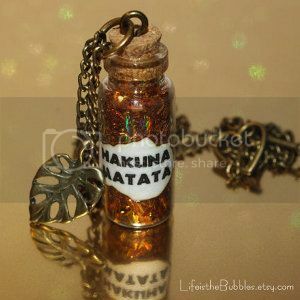 The wonderful phrase is written across a corked bottle that is filled with glittery orange confetti. 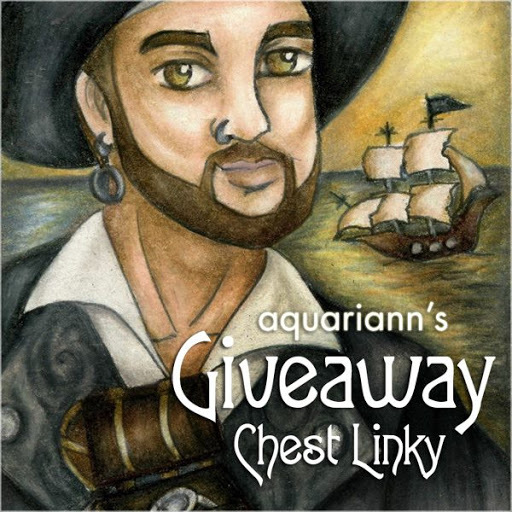 The 1.25" magical bottle hangs upon an antique bronze chain that is 19.5" long, embellished with a palm leaf charm and closes with a heart-shaped toggle clasp. 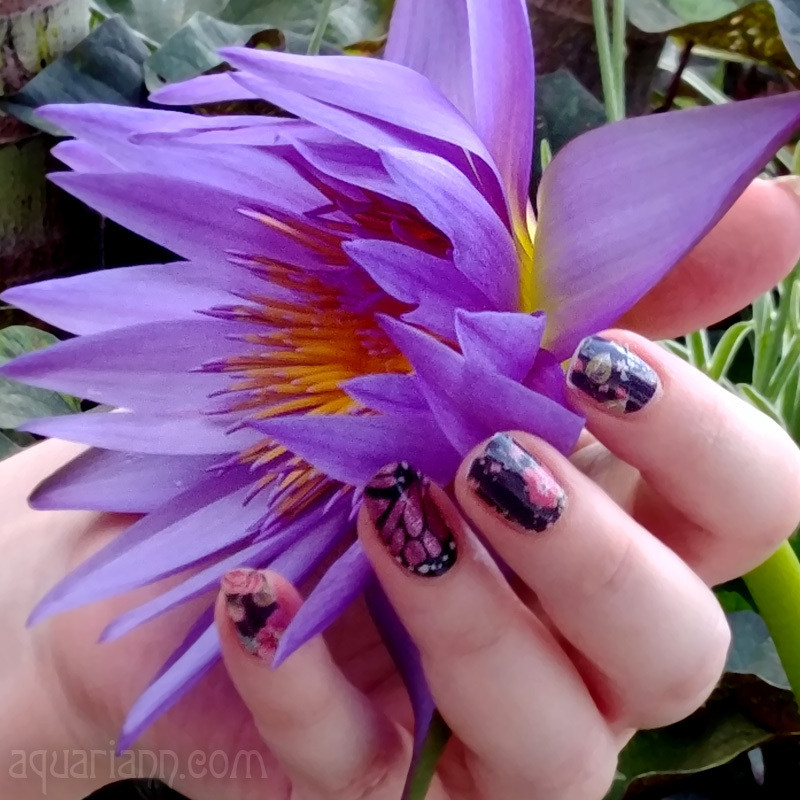 These are great finds! Thanks for sharing. The fall maple necklace is stunning!